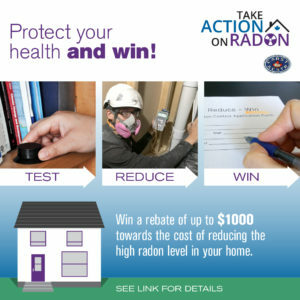 Radon is a radioactive gas that invisible, odourless and tasteless. Radon is a contaminant that occurs naturally when uranium in the soil and rock breaks down affecting indoor air quality worldwide . Radon that is released from the ground into the outdoor air is diluted to levels that are not of concern. Radon in homes and other enclosed spaces however can sometimes accumulate to high levels, which can be a health risk to you and your family. You can purchase a do-it-yourself test kit from The Lung Association or home improvement retailers (look for long-term kits that allow for at least a three month testing period. Hire a certified radon professional. To find out more details about testing, click here. Take Action To Reduce Radon Levels In Your Home. The 2018 – 2019 contest is now open. Submit your entry online. Contest information.